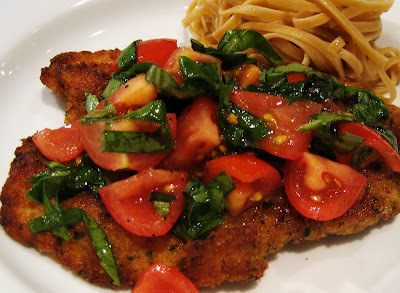 One of my favorite dishes is a simple crispy, golden brown chicken cutlet. Using a meat mallet, I lightly pound the cutlets until they are of equal thickness. To keep things interesting, I try to find new ways of serving the chicken cutlets. Luckily, sweet campari tomatoes are available year round and make this dish easy to put together. The sweetness of the tomatoes combined with the fresh basil remind me of summertime. Mix together the tomato topping ingredients in a bowl and set aside. Beat the eggs and dip the cutlets first into the flour, then eggs and then the breadcrumbs and press with your fingertips to help the crumbs adhere. Over medium heat, place the butter and olive oil in a large frying pan and cook the cutlets on each side for approximately 2 minutes until browned. Transfer the cutlets to a sheet pan and continue baking in the oven for an additional 10 minutes until cooked through. Serve on individual plates with a scoop of the fresh tomato basil topping. This dish looks delicious. It's very colorful and fresh looking. I can't wait to make it next week. Keep the recipes coming...!!!! This is a great recipe! I was out of ingredients so I modified it slightly - instead of flour and eggs, I used coconut milk and olive oil as a binder.